What seems like many moons ago now, in our camping days with young children, we had a spares bag. In effect, an old school gym bag that stored all the spare bits and pieces we might one day need, but probably never will. Spare guy ropes, puncture repair kits, for the bikes and the air beds, screwdrivers, spanners, dummies, Milton tablets for sterilising baby bottles, lip balm, you get the picture. Our spares box holds everything that we may just need an extra of. Spare batteries, the age old lip balm. Dummies have been replaced by spare phone chargers. A bottle opener from a long forgotten Christmas cracker and duct tape. Duct tape, the answer to everyone’s prayers. 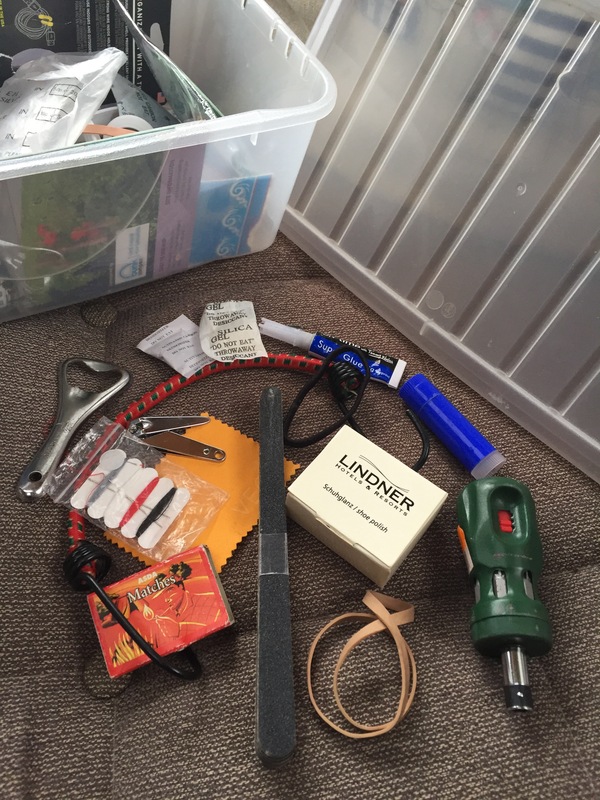 Cable ties, spanners, screwdrivers and a hotel complimentary sewing kit. Things we may never need but you never know. Coloured lolly sticks, why? I don’t know but I guarantee if I throw them, he’ll need them. Bits of string and elastic bands. A spare peg puller and a couple of clothes pegs. Pens, we can still never find one when we want one. Our man drawer is really just an overflow from the spares box, but things we may need to get our hands on sooner rather than later. Sunglasses, pens, coasters, multi tool kit. Leaflets and vouchers are collected and hide in here, to be discovered later in the year well past their expiry date. Notepads, battery powered lights and a torch, just in case. I must admit I also sneak a few bits into his man drawer. Tea lights, smelly ones for inside and citronella for outside. Box of matches, from Asda, haven’t shopped in Asda for over 10 years! I remember Asda, wish I had one nearer to me. I digress, a cigarette lighter, just in case our clicker gives up the ghost. Matches used to get damp in the tent so always have a lighter to hand. A small spirit level just so The Boss knows the bubbles are where he would like them. Hotel samples of shower gel and body lotion add to the sachets of ketchup and mayonnaise in the spares box. Just in case we ever run out. In fact our collection of complimentary ketchup, mustard and mayo sachets has now got too big and now has it’s own box. Wonder how many other people squirrel away sugar packets and sachets of sauces and then still buy bottles of the stuff to take with you. Bobbles, neither of us have tied our hair up for years. One of us hasn’t even got any hair. I must admit though I have been known to use one to seal an opened family size bag of crisps. Not often though, crisps are my weakest link. Email addresses and site recommendations from people we meet whilst out and about hide themselves in our man drawer. Bits and pieces that end up on the front window sill that make it look untidy get scooped into the man drawer. Things to be tidied on another day. Spare reading glasses from another age that probably mean my arms still aren’t long enough. The motor mover remote, a plug that checks the polarity in foreign climes. All these things I’m not sure we really need but cannot live without, just in case, you never know, that’ll come in handy one day. 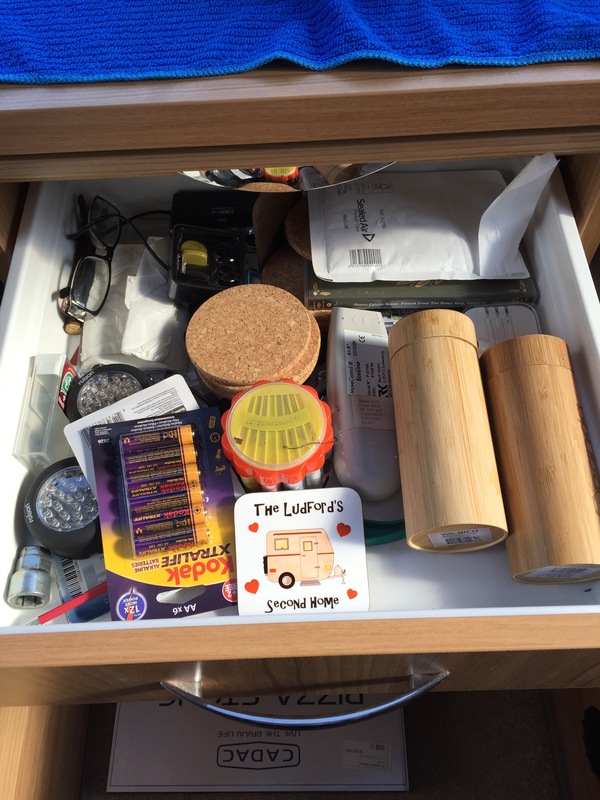 We have exactly the same man drawer in our van. Very interesting and I note all the bits in the “man drawer” are of use. Do you have and are you willing to disclose what may be in it, a ” woman drawer” Perhaps a handybreply book for the popular phrase. SHES NOT PEDALLING ON THE BACK. We have just changed our van of 16 years for a brand new one. Part of the move was to sort the man drawer. 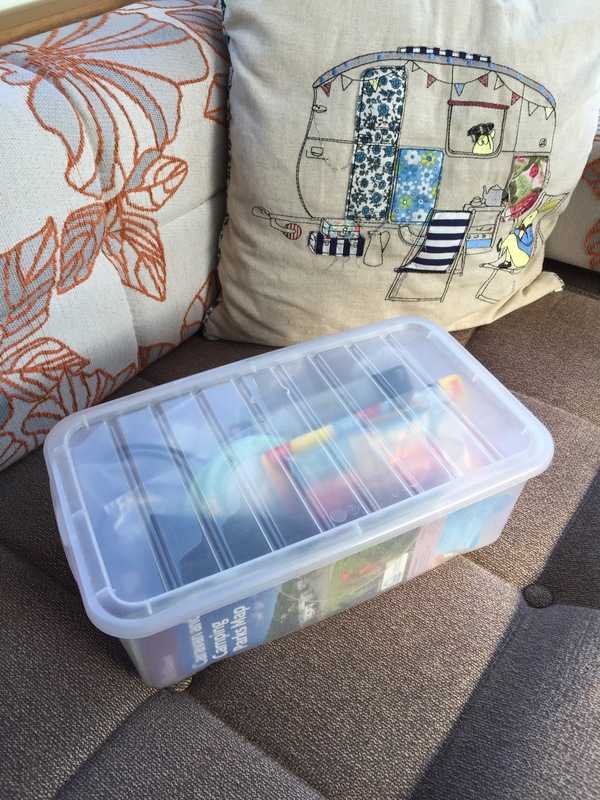 Guess what, we now have a man box containing the contents of the old man drawer ( I couldn’t bring myself to throw anything away, just in case ) and some new additions. I thought it was only me. LOL.